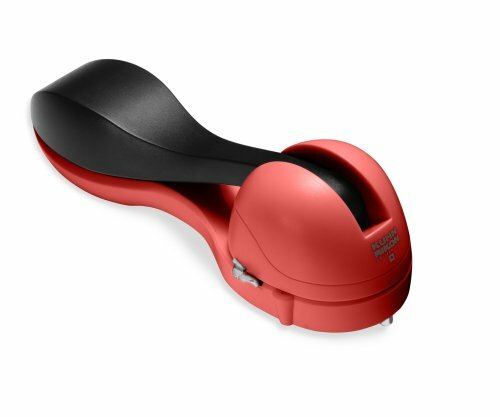 If you are looking for the best can opener ever for left handed people, then take a look at the latest in a line of kitchen gadgets that have been designed to make life a little easier for the left handed people like me! If you are a left handed person trying to cook in a right handed kitchen you basically have learned to adapt, or ended up with small annoying injuries because of using gadgets designed for the right handed person. The simple can opener can be a source of frustration at the best of times, but when they are designed to be used in such a way that the strongest hand has to be the right, it can cause frustration. But at the same time you don't want to be duplicating gadgets in the kitchen for others in the household. So, what do you do? You get yourself a good top cutting can opener that can be used by both left handed and right handed people. You may think that many can openers can be used by either hand but most are designed for the strongest hand to be the right. This one by Kuhn Rikon has to be the best can opener ever, especially for the left handed people in your life or yourself. It can be used by anyone and it doesn't matter which hand is your strongest. It cuts the top off and with the push of a button it will drop it so that you don't have to handle it and end up cutting yourself. For years, I would get someone else to open a can, or simply buy bottles as I found the simple can opener a complete source of frustration. I have managed to adapt to the right handed ways with scissors, knives etc, although you will see me eat soup with my left hand, but the kitchen gadgets to me had to be the most frustrating. I am a true left hander, not very good with the right, so to find simple gadgets such as this one works well for me and the rest of the family. Rather than purchase a purely left handed one, which you can get if you would prefer that style, I opted for one that works for both. If you are in the market for some left handed gadgets such as the best can opener ever, or other useful items, then you can find specialty left handed stores, but you can get some pretty good deals online at sites such as Amazon. Do, some surfing to see just what is available and the prices. Many gadgets are being designed to be used by anyone now, no matter which hand is your strongest. Life is getting much easier in the kitchen for the "south paw". Considering that approximately 10% of the world is left handed, it is nice to find gadgets that are created to help in a right handed world. I did not know that they made left-handed can openers! My son is a lefty, and it is hard for me to watch him do things meant for righties. This is good information to have! My oldest is a lefty, his wife is a righty, they have 2 sets of everything so he has no excuse to help with the cooking, etc. Ha!